The red coloration found in bromeliads, cranberrries, carnivorous plants, etc., is caused by plant pigments known as anthocyanins. Because of the interest created in pigment-free forms of certain carnivorous plants, Barry Meyers-Rice (UC-Davis), the editor of The Carnivorous Plant Newsletter, asked me to put together a brief summary of the science of these pigments. While somewhat technical, it's a fascinating topic, especially in the areas of evolution and biology. If you're interested in learning more about this topic, read on! Anthocyanins are members of a class of nearly universal, water-soluble, terrestrial plant pigments that can be classified chemically as both flavonoid and phenolic. They are found in most land plants, with the exception of the cacti and the group containing the beet. They contribute colors to flowers and other plant parts ranging from shades of red through crimson and blue to purple, including yellow and colorless. (Every color but green has been recorded). In their second major role, anthocyanin-related pigments serve as a UV screen and are produced in response to exposure of the plant to UV radiation, protecting the plant's DNA from damage by sunlight. (UV causes the paired strands of genetic material in the DNA double helix to become cross-linked, preventing cell division and other vital cellular processes like protein production). And in a third, and no less significant role, anthocyanins serve as anti-feedents, their disagreeable taste serving to deter predatory animals. In a related defense mechanism, anthocyanin production can be induced by ionizing radiation, which can damage DNA as readily as UV can. Chemical messengers apparently signal the damage to DNA and induce anthocyanin production in these plants. 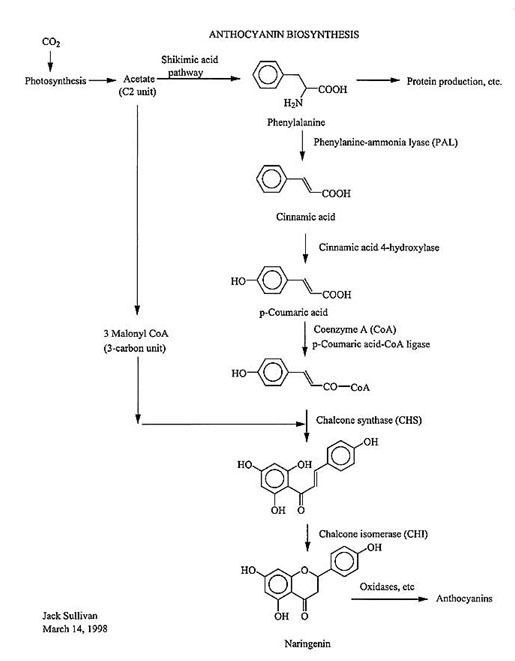 The biosynthesis of this class of pigment is accomplished by a series of enzymes that are bound to cell membranes and that help convert two central biochemical building blocks derived from photosynthesis (acetic acid and the amino acid phenylalanine) found in the cell's cytoplasm through a series of discrete chemical steps into the final pigments, which are then excreted on the other side of the membrane into vacuoles in the epidermal cell layer. Significant genetic change in the DNA coding for the production of these enzymes results in loss of pigment production. Anthocyanin pigments can be produced by growing plant cells in tissue culture. Plants having no pigmentation themselves in cultivation were subsequently demonstrated to produce anthocyanin in tissue culture. Anthocyanin-type pigments are found only in terrestrial plants. They are not found in animals, marine plants or in microorganisms. It is theorized that anthocyanin production is an evolutionary response to plants first venturing onto the stark primordial landscape under intense UV radiation. (Significant screening of the earth's surface from the effects of UV radiation didn't occur until after the advent of terrestrial plants. Oxygen in large amounts first had to be generated by the photosynthesis of land plants before the UV-screening ozone layer was formed). The evolution of insect vision to respond to the unique wavelengths of light presented by flowering plants is an interesting scenario, as is the evolution of these plants to take advantage of the insect's attraction to the sight of anthocyanins. Obviously, the plants came first and developed anthocyanins as a defense mechanism long before the first insect evolved. Flowering plants subsequently found in anthocyanin a handy way to attract pollinators. Carnivorous plants took advantage of the pollination attraction mechanism to serve as an effective visual lure for their prey. Anthocyanin pigments are assembled from two different streams of chemical raw materials in the cell: both starting from the C2 unit acetate (or acetic acid) derived from photosynthesis, one stream involves the shikimic acid pathway to produce the amino acid phenylalanine. The other stream (the acetic acid pathway) produces 3 molecules of malonyl-Coenzyme A, a C3 unit. These streams meet and are coupled together by the enzyme chalcone synthase (CHS), which forms an intermediate chalcone via a polyketide folding mechanism that is commonly found in plants. The chalcone is subsequently isomerized by the enzyme chalcone isomerase (CHI) to the prototype pigment naringenin, which is subsequently oxidized by enzymes like flavonoid hydroxylase and coupled to sugar molecules by enzymes like UDP-O-glucosyl transferase to yield the final anthocyanins. More than five enzymes are thus required to synthesize these pigments, each working in concert. Any even minor disruption in any of the mechanism of these enzymes by either genetic or environmental factors would halt anthocyanin production. Anthocyanin production was used as a visual marker in early studies of chemotaxonomy, which studies the relationships of organisms based on their biochemical constituents. It gave support to the one gene-one enzyme theory that is a central tenet in the field of molecular biology. 3. Natural Product Chemistry , by Kurt B.G. Torssell, pp. 138-145. John Wiley & Sons, 1983. ISBN 0-471-10378-0 (paperbk). 5. Tillandsia , by Paul T. Isley III, p. 92. Botanical Press, 1987. ISBN 0-9617675-0-2.